Being that it was a big birthday for her I wanted to make a cake that was out of the ordinary, and not a typical number 80 cake or a cake decorated in sunflowers. 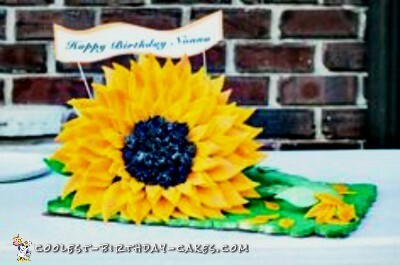 So, after hours of sketches and ideas I finally had the idea of a 3D sunflower cake. The cake was a white chocolate flavored cake with a raspberry cream cheese filling and buttercream frosting. I used Rice Krispies for the stem and fondant to cover and add detail. The reaction I received from my family should have be caught on camera. They could not believe it was actually a cake. My grandmother cried (tears of joy, of course) and was so proud of me. After the 12 hours it took to make this cake, it was worth it to see my grandmother so happy.